This is a little bit of a departure for me, but this particular post does not have anything to do with optics. Now that we’ve got that shocking revelation out of the way, here is some background to this story. A couple of months ago, I had to go to France for work and it looked like I would finish early and have a couple of days to explore. Somehow, I had a brilliant idea that I should rent bicycle and pedal around for a day or two in the French countryside. Having read Jerome K Jerome’s “Three Men on a Bummel”, (Three Men in a Boat and Three Men on the Bummel), I decided to approach this in a manner befitting someone both gadgety and lazy. Hence, my next thought was that I should give some thought to how to carry stuff on a bicycle in the least objectionable manner. Naturally, with internet at my disposal, I looked a little to see if someone else has come up with a properly elegant solution to this problem. Enter a small Canadian company called “Two Wheel Gear“. They make a product called “Garment Pannier” (which was the first time I heard the word “pannier”) that seemed perfect for my purposes. With that in mind, rather than try to re-invent the wheel, I made arrangements to get my hands on one. I am sure we all know the story about the road to hell and good intentions. Naturally, the bag did not show up until I was already in France, and my work schedule got so complicated that I barely had time to breath, much less bike around. Nevertheless, once I got home, I fished the garment bag out of my mail and proceeded to examine it very closely. 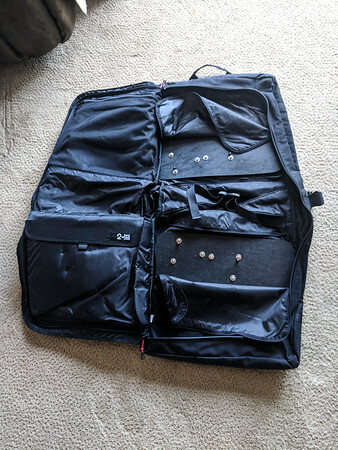 A little more background: my work requires a lot of travel, so I am extremely picky about bags and have learned a good deal about what works and what doesn’t. Then there are my hobbies which require me to pack rather heavy things and, occasionally, walk with them strapped to me for reasonable distances. In other words, I have had all sorts of bags fall apart on me at the worst possible moment. 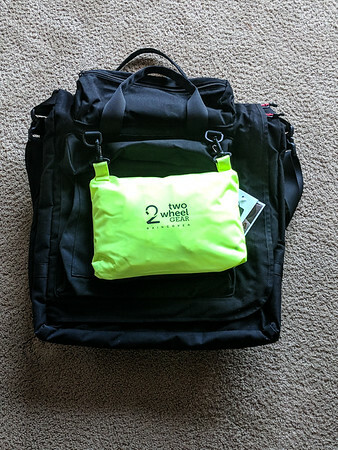 The bag from Two Wheel Gear looks and feels well made. Having seen all sort of silly gadgets over the years, I really can’t fault how this bag is constructed and it is clearly intelligently designed. There are several pockets on the outside, a couple of them expandable. The zippers are appropriately heavy duty and the bag comes with a raincover. All cinched up with a raincover on the outside (it is detachable). This is small enough to take as a carry-on on most planes. A strap keeps it from flapping open if you are using it off the bike. On the inside surfaces is the hardware to attach the bag to the bike rack. 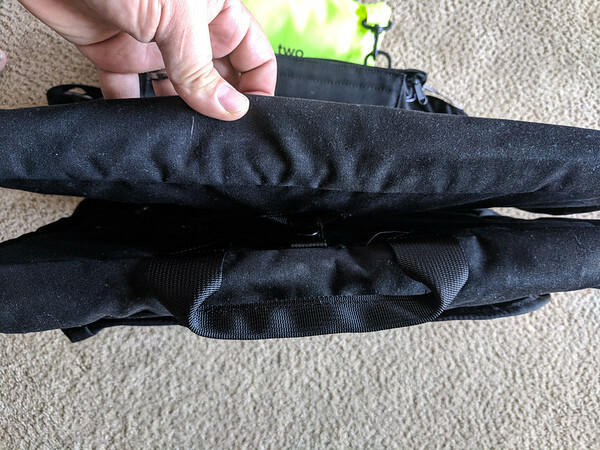 The outside pockets are on both sides of the bag and the larger ones can fit the rain cover if you do not want it dangling on the outside. 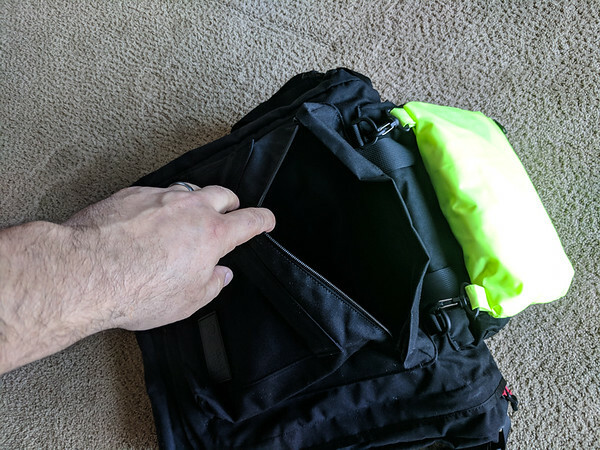 Once you open it completely, you see several pockets on the inside with a padded laptop sleeve (bottom left) a large mesh pocket and two small ones and a couple of straps. 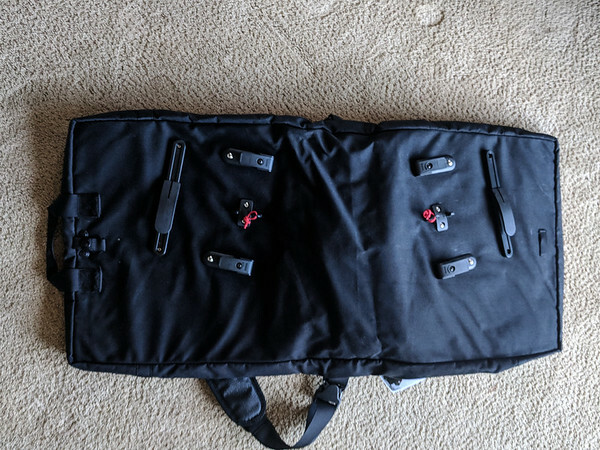 What is equally important is that the backing plates that give the bag rigidity are easily accessible via a couple of zippers. The mounting hardware is hooked up to those plates, so if something breaks, the bag is easy to service, likely by the user. The location of the laptop sleeve is where I am a bit mixed. Putting it on the inside keeps your electronics secure. However, if you fly, that means you have to open the whole back to get the laptop out for security screening. For me, that would be a significant hassle. Aside from the laptop sleeve location, I really only have one complaint about this bag and that is size. Now, in all fairness, the bag is designed for a typical bike rider and is likely limited by typical dimensions of bike racks. Unfortunately, I am a little larger than that. If you imagine a typical biker (as in bicyclist), you think of someone lean, happy, and slim. Now if you imagine a typical 300lbs biker (as in someone motoring down the freeway on a Harley), shave of the beard and replace leather with regular clothing, you get a pretty good visual of what I look like. 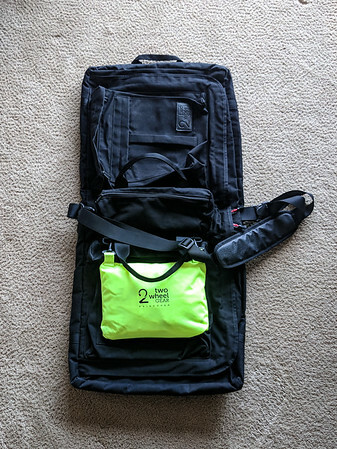 Here is my XXL shirt on top of the 2 Wheel Gear bag. I think you see my predicament. 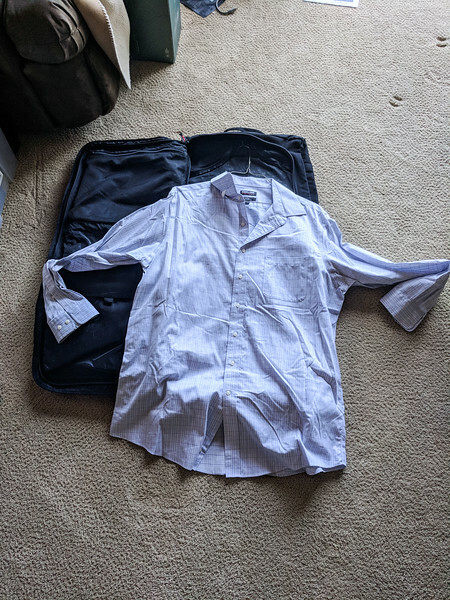 There is no way to pack my clothing into this bag without everything getting really wrinkled up. If you I have to bring a sportjacket, it is even tighter. Now, to summarize: nice bag, excellent design, good workmanship. However, be aware that the laptop sleeve is on the inside and, if you are of a size that is typically used to intimidate the villagers, it is too small for you.